Available in either stationary or mobile configurations to suit every application. Each unit is truly “all-in-one” utilizing a single, intelligent, multi-function display. Based on this singular display unit, almost endless variations and options are available to fully optimize every last facet of your compressed air or gas line. By measuring the various parameters available to the user, plants can operate with maximum energy efficiency, increased production results, and absolute control over energy consumption and the associated savings. 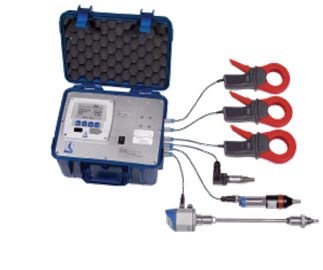 Measuring capabilities include: Pressure Dew Point, Air Flow, Pressure, Current, Temperature. These all inclusive packages also feature, as standard, 4 to 20 mA output signals, two alarm relays, and USB connectivity. Full data logging with 1,000,000 data transmission capacity comes standard, and when used in conjunction with the optional software package, creates the perfect analytical tool down to the finest detail. In addition to being a completely customizable user solution and all of the standard features, the METPOINT PRO series has several options to ease installation from an engraved depth scale on the flow meter sensor, to special spot drilling collars and drilling jigs. Every detail has been carefully thought out and considered to guarantee the maximum return on investment in the shortest amount of time possible. The true all-around solution, the METPOINT PRO series from BEKO. Integrated Data Logger Up to 1,000,000 values Recording intervals: min. 1 sec. / max. 59 min. 59 sec.